NordicTrack C 700 Treadmill Review - A Best Buy Rating! The NordicTrack C 700 Treadmill is ON SALE! The NordicTrack C 700 treadmill is a step up from the popular discontinued C 630 model with a larger motor and more sophisticated Multi-Window LED display. 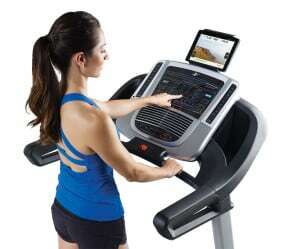 In addition, it has an integrated tablet holder, a high quality sound system, and 20 preloaded workouts. The C 700 comes from NordicTrack, which is part of the largest fitness equipment manufacturer in the world, Icon Fitness. There are many great models in the NordicTrack line, so be sure to check out your options. The C models are the most affordable with the C 700 just one step up from the entry model. Still, it offers some nice features for the price including iFit technology. MID-WEEK SALE ENDS THURSDAY: The NordicTrack C 700 is priced at $799 with Free Shipping. No interest financing is available. 2.75 Continuous Duty HP Motor — The motor on this machine is designed for walking and jogging. Serious runners might consider another Nordictrack model. Multi-Window LED Display – This multi-window display allows you to view all of your stats easily. It shows your heart rate, distance, and even calories burned with an integrated calorie burn meter. 22″ x 55″ Treadbelt — Taller individuals who jog may feel restrained by the 55″ length. This is an average treadbelt length fort this price range. The width on this belt is extra wide which adds a nice bit of comfort. Shock Absorption — The NordicTrack C 700 comes with FlexSelect Cushioning so you can turn a wheel to mimic either a firm road-like surface, or dial it back to a double cushioned knee-saving soft surface. We like this option. iFit Coach Ready — This features allows you to connect your smart device to the machine to maximize your workout. Create customized routes using Google Maps, track your progress towards fitness goals, and enjoy automatic stats tracking. This is a really great feature, but be warned, it comes at a cost. A monthly subscription is required to enjoy the iFit benefits. Learn more about the iFit Live subscriptions here. 20 Pre-Installed Workout Programs — The NordicTrack C 700 comes with 20 preloaded workout programs developed by certified personal trainers. This is a nice variety of workouts that can help take the boredom out of running in place. Some of the other NordicTrack models (like the Commercial 1750) have twice as many programs pre-installed. Speakers and MP3 Input — This has one of the better sound systems on the market today. Plug in your iPod to enjoy music directly from dual 2″ speakers. SpaceSaver Design – This machine will fold up to allow for easier storage and cleaning. Warranty — Lifetime Frame, 25 yrs Motor, 1 yr Parts & Labor. This warranty is about average at this price range, but some competitively priced treadmills may only have 6 months parts and labor. It should be noted that ALL of NordicTrack’s other treadmills have a “Lifetime” warranty on the motor, so this reflects a lower quality and lower confidence on their part that the machine will last indefinitely. The NordicTrack C700 is a nice option if you want an less expensive machine that is one step up towards serious fitness. It has a decent sized motor and some attractive technology features perfect for the person doing casual jogging or just starting out. A serious runner or someone who is excessively overweight will want to consider one of the other NordicTrack models with a little bit more juice in the construction. NordicTrack, in general, is able to offer more for less compared to the competition, since they are part of the monster manufacturer, Icon Fitness. Another Icon brand to consider is Proform Fitness. See a complete chart of all NordicTrack models here. what are the dimensions of a folded-up c700? need to know today to take advantage of your sale. Thanks for your question. 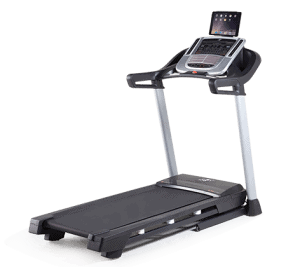 The NordicTrack C700 is 73.5 inches in length and 60.5 inches in height by 35.5 inches in width. These are the unfolded dimensions. For folded dimensions it will be 66.5 inches tall and 38 inches in length x 35.5 inches in width. Let me know if you have additional questions.